The MS710C/F has been designed as a high-performance microwave spectrum analyzer with wide user applications. The MS710C/F is easyto- use and has a variety of functions suited to users requirements. 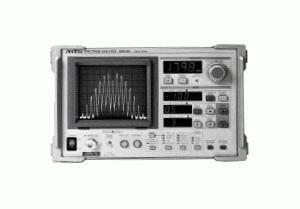 Use of a simplified PLL synthesizer local oscillator gives a high accuracy of 30 kHz/6.5 GHz (MS710C) and a high resolution of 100 Hz/6 dB (=70 dB/3 dB).